Microbial properties are often used to assess the recovery of soil health during phytoremediation. A field survey was conducted to test the effects of different plant metallophytes (excluder and hyperaccumulator) on soil microbial characteristics. 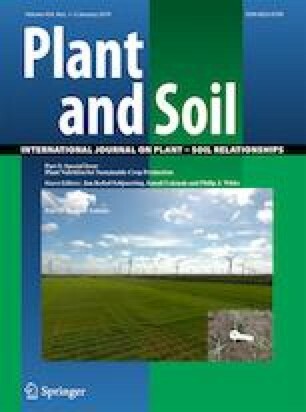 Microbial properties in the rhizosphere of four metallophytes (Sedum alfredii, Rubus hunanensis, Lysimachia christinae and Clinopodium gracile) growing naturally on highly Cd-, Zn- and Pb-contaminated soils were investigated. Microbial biomass carbon, basal respiration, enzyme activities and phospholipid fatty acids were analyzed to study microbial community function and composition. The total microbial biomass, bacterial, actinomycete, fungal, and protozoan PLFAs, basal respiration and enzyme activities in the rhizosphere of metallophytes were significantly higher than in bulk soil. Moreover, the largest increases were found in the rhizosphere of the hyperaccumulator S. alfredii. The microbial community composition in the rhizosphere of S. alfredii was significantly different from the other 3 plants. Redundancy analysis showed that soil physico-chemical properties such as metal concentrations, labile carbon and pH explained most of the variation in microbial community biomass, activity and structure. Metallophytes using different strategies to adapt to metal-rich soils induced different effects on soil microbial properties, which were also influenced by physico-chemical characteristics. We are grateful for the financial support from the National Natural Science Foundation of China (Nos. 41501345), the Natural Science Foundation of Fujian Province (Nos. 2015 J01155) and the Foundation for Distinguished Young Scholars of Fujian Agriculture and Forestry University (Nos. XJQ201628).